MELBOURNE, Florida -- In a surprise announcement today, former U.S. Congressman Dave Weldon of Indialantic, Florida, announced that he had thrown his hat in the ring for the Republican primary nomination to unseat Democratic incumbent Florida U.S. Senator Bill Nelson. Weldon had represented the 15th Congressional District of Florida which covers portions of Brevard County (also known as Florida's Space Coast) for fourteen years from 1994 to 2008. Coincidentally, it is the same U.S. Congressional seat that Nelson held for twelve years from 1978 to 1990. Like Florida U.S. 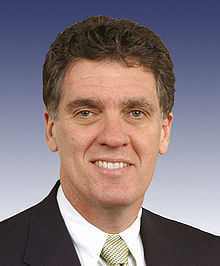 Senator Mel Martinez, Weldon did not seek re-election after voting for the Troubled Asset Relief Program in 2008, better known at TARP, which fueled the anti-bank bailout Tea Party movement across the nation and also in Weldon's heavily conservative Central Florida congressional district. Despite a lack of banking experience, Martinez took on a prestigious banking job with Chase Bank after voting for TARP and leaving the U.S. Senate. Weldon did not go into banking after voting for TARP and leaving politics, but instead has laid low from the political spotlight for the last four years practicing medicine and chairing the International Israel Allies Caucus Foundation. "Today I announced that I am officially running for the United States Senate. Many Floridians feel President Obama has traded America's greatness for international acceptance, turned his back on our Constitution and the intentions of our founding fathers, people of faith and the economic engine that helped make America great. Someone has to do something to provide a Conservative answer to the problems the Administration has created and the current Senate has endorsed. We can’t keep racking up debt and placing it on the backs of our children. It’s time to stop the spending and balance the budget again. Together, we can change Washington – I helped do it once – and I can help do it again." A rival candidate for the Republican nomination for the U.S. Senate, Senator George LeMieux, said during a Brevard Times interview last month that he "would not have voted for TARP" and that "government should not be business of picking winners and losers."